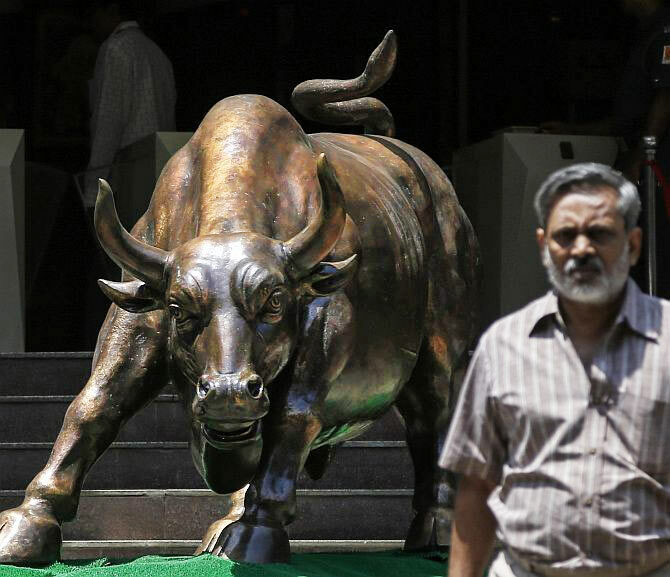 The benchmark indices shrugged off the Greece uncertainty to end at around six-week highs on the back of strong May core sector growth back home and positive cues from the global market front. The above-normal monsoons also boosted sentiment on Dalal Street. The BSE Sensex reclaimed the psychologically crucial mark of 28,000 to end at 28,020, stronger by 240 points or 0.8% and the Nifty ended above the technically important level of 8450 at 8,453, up 84 points. The broader markets out-performed their largecap counterparts; the BSE Mid-cap and Small-cap indices ended higher by 1.4% each at 10,828 and 11,232 respectively. Growth in production in the eight key infrastructure sectors hit a six-month high of 4.4% in May, after two consecutive months of decline, indicating a recovery in industrial activity. The index of these eight core sectors grew 3.8% in the corresponding month last year. The rupee pared its initial loss and was trading at 63.64 against the dollar in noon trades amid bouts of dollar selling by banks and exporters. The rupee had opened lower at 63.66 a dollar at the Interbank Foreign Exchange as against 63.64 in the previous session. According to the India Meteorological Department (IMD), the country received around 189.5 millimetres of rain in June as against a normal of around 163.6 millimetres. Global markets have stabilized, after being rattled in the previous session, even as Greece ended up defaulting on its euro 1.55 billion loan ($1.73 billion) to the International Monetary Fund on June 30, with creditors rejecting a last-ditch effort to buy more time. Meanwhile, rating agency Fitch has cut its long-term rating on Greece to 'CC' from 'CCC' amid turmoil over the country's debt negotiations which resulted in fears that the nation could make an exit from the euro zone. The Asian stocks edged higher as investors apparently took Greece's missed loan payment to the IMF in their stride. The key benchmark indices in Japan, Indonesia, South Korea, Singapore and Taiwan gaine dupto 1% each. China's Shanghai Composite was, however, down 1.9%, while the Hong Kong market was closed for holiday. The European mindices, including FTSE, CAC and DAX have gained 1-3% each on hopes that the Greece Prime Minister Alexis Tsipras was likely to accept most bailout conditions. All the sectoral indices ended in the green, with the exception of the FMCG space. Banking, auto and capital goods ranked among the major gainers. Among the individual heavyweights, Bhel, Axis Bank and Cipla were the major gainers on the BSE, while Lupin, Bajaj Auto and ITC ende dweak. On the sectoral front, public sector undertaking (PSU) banks were back into action, gaining 2%-6% each, on reports quoting the Minister of State for Finance Minister Jayant Sinha as saying that the government was drawing up a comprehensive package to help state-run bank and improve the flow of credit to industry. State Bank of India, Oriental Bank of Commerce, Union Bank of India, Bank of India, Canara Bank and Punjab National Bank gained 2%-4% each. The private banking space also rose in tandem, with ICICI Bank, Axis Bank and Yes Bank rallying between 1% and 3% each. Auto stocks gained strength post auto major Maruti Suzuki's June sales numbers. Maruti Suzuki was up nearly 1% after the company sold 114,756 vehicles in June, 2015, registering a growth of 1.8% over the previous year. Tata Motors, M&M and Ashok Leyland ended higher between 1% and 2% each. In the capital goods space, BHEL, L&T and BEML added 1%-2% each on the back of the core sector growth numbers. On the other hand, ITC shed 0.4%, dragging the FMCG index lower in the process. The market breadth was strong, with 1,877 gainers as against 901 losers on the BSE.